Why did I not think of that when making my cordial the other weekend? I find that getting it bug free is harder than you think and there are considerably less bugs in the early morning. .-= Helen (Fuss Free Flavours)´s last blog ..Breakfast Sundae – Banana -amp Strawberry Ice “Cream” =-. I’ve wanted to do this – but the only elderflowers around here are in others’ gardens… Sob. .-= aforkfulofspaghetti´s last blog ..cheese- please- but pass on the service- La Fromagerie =-. Helen (Fuss Free Flavours): Glad you like the idea. If you don’t find anymore blooms then try it next year. This for the tip on the least buggy part of the day for picking. A forkful: Same here too, I considered using a ladder under cover of darkness….last years batch I got in Suffolk, I think it requires little trip to the countryside. 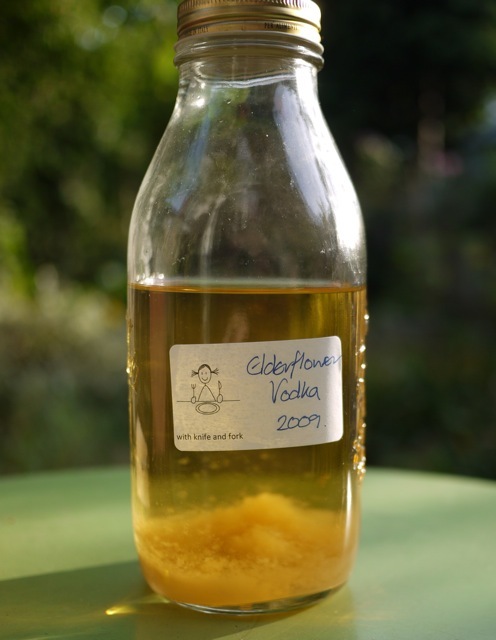 I found a recipe for elderflower vodka a few weeks ago. Mines been brewing a little while. Hope it comes out as nice as yours. .-= Becky´s last blog ..Trout Fishcakes with Broad Bean- Pancetta -amp Onion Salad =-. I strained my cordial when no one was looking and disposed of the bugs. Extra protein, makes it a complete meal. Becky: It really is delicious, I’ve tried it with soda to make a long drink and its really refreshing. All the home made fruit vodka’s are lovely, the process makes them smooth but not too strong shorts and lovely mixers with wine or fizz. Let me know how your’s turns out. This looks very nice. A great idea, instead of me always making cordial. .-= Lars Kiilerich´s last blog ..Stegt ål med nye kartofler og persillesmørsovs =-.